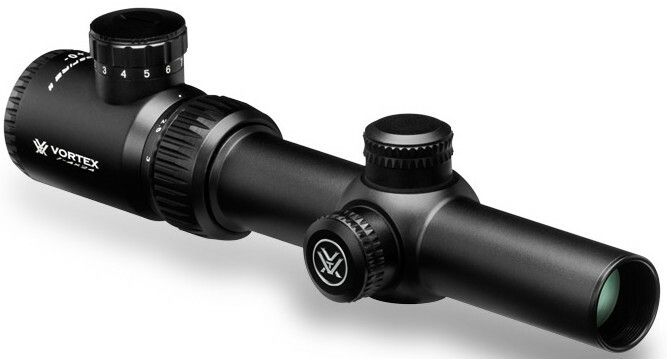 The Vortex Crossfire II 1-4x24 Rifle Scope with V-Brite Illuminated Reticle makes use of the V-Plex reticle format along with battery-powered electronics to illuminate the center dot for better low-light performance. It's designed for use during extra-low light conditions. 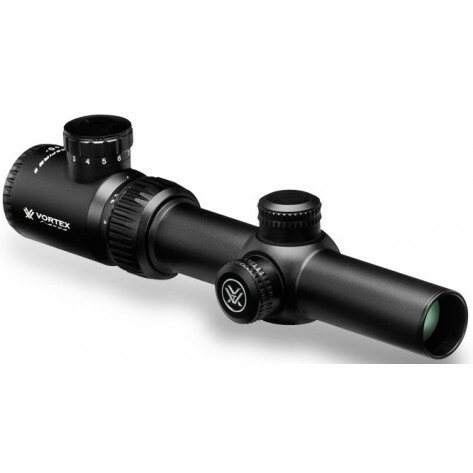 The Vortex Crossfire II 1-4x24 Rifle Scope with V-Brite Illuminated Reticle has all the features of the other scopes in the Crossfire range, with long eye relief, fully multi-coated lenses, a fast-focus eyepiece and resettable MOA turrets. It has the added benefit of a battery powered illuminated centre dot of the reticle, enabling accurate shooting under low-light conditions. 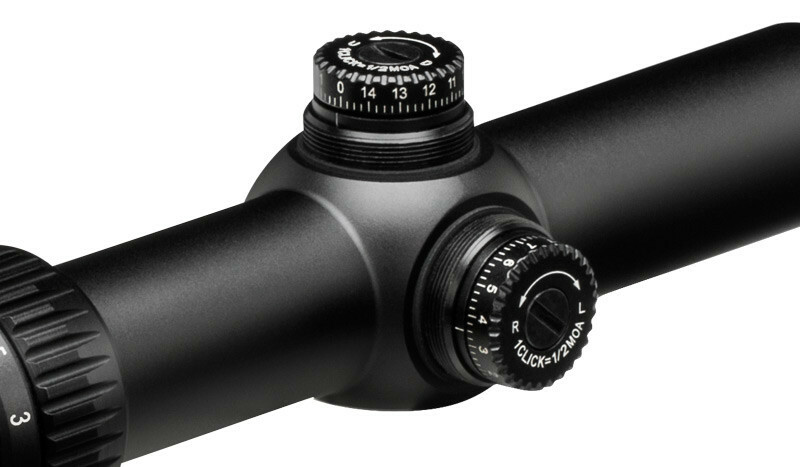 The O-ring seals and nitrogen gas purging make the rifle scope both waterproof and fogproof and provide reliable performance in all environments and conditions. Its hard anodized single-piece aircraft-grade aluminum alloy construction makes it virtually indestructible and highly resistant to magnum recoil. 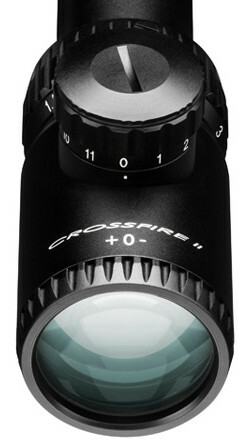 The adjustable objective allows image focus and parallax removal, which provides maximum precision on smaller targets. The illuminated centre dot provides accurate aiming point in low-light conditions. Adjustable objective provides image focus and parallax removal, allowing for maximum precision on small targets. 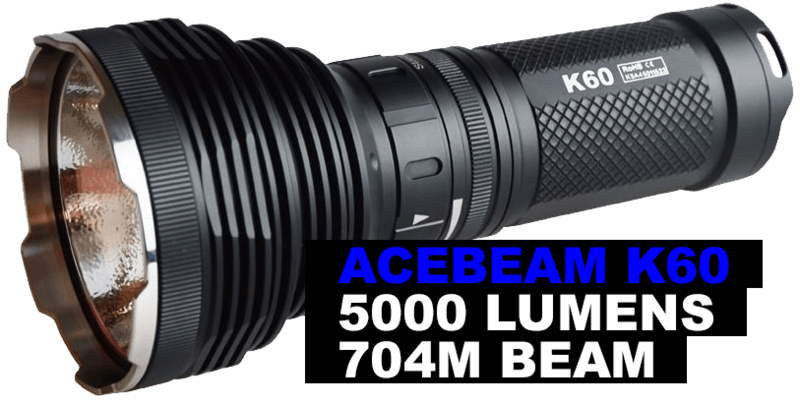 Fully multi-coated optics increase light transmission. Single piece tube maximises alignment, increasing accuracy and visual performance. Aircraft-grade aluminum construction provides strength and rigidity. O-ring seals provide waterproof protection as well as preventing dust from penetrating the monocular. Nitrogen gas purging provides fogproof performance. Capped reset turrets allow re-indexing of the turret to zero after sighting in the rifle scope.